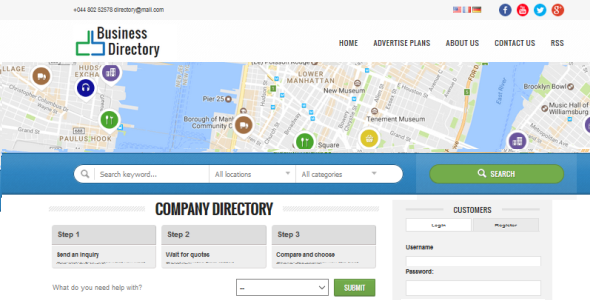 The uBusinessDirectory is a simple, but powerful Business Directory solution. This script allows to add categories, then associate added businesses to these categories. You may also add business profiles including basic business contact info, business description, website link, e-mail contact, categories, map links etc. This script was developed on MVC Framework and allows you to build business directory website in a few minutes and then easy add and edit the content. Th script provides you with all the features you need to setup your own eCommerce directory website on your own domain name. It includes every things you need for a successful website such as: listings management, search engine friendly URLs, database backup, advanced text editor, banner rotation system etc. So it is really easy to start your own successful directory website.